Jeremiah Lambert, mechanical engineer by day, art freelancer by whenever else... Doing gigs for Hasbro for both Transformers (Movie versions, Rescue Bots and the current Robots in Disguise) and Tonka Truck (Tonka Chuck) promotional art, as well as Masters of the Universe exclusives for Mattel/MVCreations. Hell House, Orpheus, and Nightmares in Oz for Viper Comics, plus lots of various other independent comic companies and comic writers. 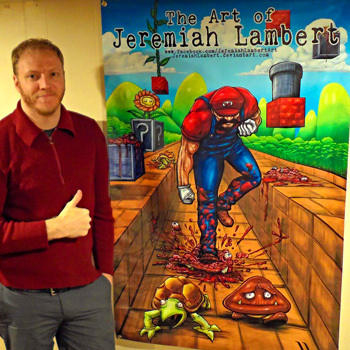 Jeremiah also has enjoyed internet viral exposure with his parody art. For pre-convention commission orders please contact him at his facebook page.